Keeping livestock is an integral part of many organic farming systems. Ruminant livestock (in the UK mainly cattle and sheep) can utilise grass and roughage as a feed resource so they do not compete with human food needs. Forage is also important for building soil fertility. For monogastric livestock (pigs and poultry), the main challenges arise from securing sufficient supply of protein to meet their dietary needs without undue reliance on imported feedstuffs, particularly soya. Organic farming systems also aim to improve animal welfare through access to pasture and to promote health through good animal husbandry. Our work in the area covers both ruminants (cattle and sheep) and non-ruminants (pigs and poultry) with particular focus on forage production and utilisation, including the role of legumes as a home grown protein feed resource and agroforestry for livestock. The iSAGE project aims to make the European sheep and goat sectors more sustainable, competitive and resilient. ORC is responsible for sustainability assessment across the project and contributes to LCA (Life Cycle Analysis) to develop a toolbox for decision making. We also contribute to socio-economic aspects of sheep and goat farming, understanding and modelling the impacts of climate change on the sector and case studies testing innovative practices. We collaborate closely with the National Sheep Association and other stakeholders in the UK and beyond. One of the biggest issues in organic pig and poultry production is meeting their requirements for protein from organic sources. Producers rely on a derogation to organic standards that has allowed the inclusion of up to 5% non-organic feed. OK-Net Ecofeed supports the aim to feed pigs and poultry a 100% organic and regional diet in future, looking into the inclusion of peas, faba beans, other protein sources and also into the role of forage in meeting the nutritional needs. Marion Johnson, Lindsay Whistance and Susanne Padel and Bruce Pearce. Sustainable economic and ecological grazing systems- learning from innovative practitioners (SEEGSLIP) The project aims to evaluate the ecological, agronomic, economic and social impacts of the pasture fed livestock approach to grazing management and its potential as the basis of a sustainable GB-wide system. Innovation for Sustainable Sheep and Goat Production in Europe (iSAGE) Horizon 2020 Innovation for Sustainable Sheep and Goat Production in Europe (iSAGE) is making the European Sheep and Goat sectors more sustainable, competitive and resilient. These improvements come from strong collaboration between industry and research institutions. Sustainable Organic and Low Input Dairying (SOLID) EC FP 7 Improving the technical performance and economic competitiveness of organic and low input dairy systems in Europe while maximising their potential to deliver environmental goods and enhance biodiversity. Includes a large component of farmer participation. Improved contribution of local feed to support 100% organic feed supply to pigs and poultry (ICOPP) Defra for UK work as part of the Core Organic II The aim of ICOPP is to produce economically profitable feeding strategies based on 100% organic feed across Europe, which will supply poultry and pigs the required level of nutrients throughout their lives while supporting high animal health and welfare. See all completed projects here. Crawley, Kenny and van Krimpen, Marinus (editor): Smith, Jo; Gerrard, Catherine L and Sumption, Phil (Eds.) (2015) Fulfilling 100% organic poultry diets: Concentrates. ICOPP Technical Notes, No. 1. Organic Research Centre. Crawley, Kenny (editor): Smith, Jo; Gerrard, Catherine L. and Sumption, Phil (Eds.) (2015) Fulfilling 100% organic poultry diets: Roughage and foraging from the range. ICOPP Technical Notes, No. 2. Organic Research Centre. Crawley, K. (editor): Smith, Jo; Gerrard, Catherine L. and Sumption, Phil (Eds.) (2015) Fulfilling 100% organic pig diets: Concentrates. ICOPP Technical Notes, No. 3. Organic Research Centre. Crawley, Kenny (editor): Smith, Jo; Gerrard, Catherine L and Sumption, Phil (Eds.) (2015) Fulfilling 100% organic pig diets: Feeding roughage and foraging from the range. ICOPP Technical Notes, No. 4. Organic Research Centre. 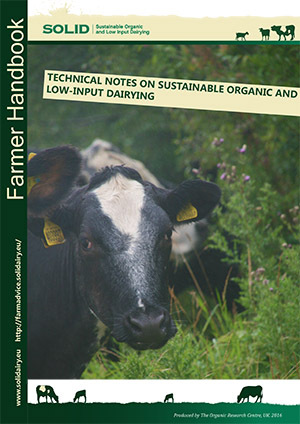 Leach, Katharine; Barker, Zoe; Maggs, Clare; Sedgwick, Anouska; Whay, Helen; Bell, Nick and Main, David (2012) Activities of organic farmers succeeding in reducing lameness in dairy cows. In: Rahmann, Gerold and Godinho, D (Eds.) Agriculture and Forestry Research (362), pp. 143-146.